The fourth opening reception of the Student Art Exhibition took place on the second floor of the Wilbur Cross Library on September 5. The exhibition features work from undergraduate and graduate students. The Student Art Exhibition Opening Reception showcased art by undergraduate and graduate students at the University of Connecticut, Tuesday night in the Wilber Cross Building. 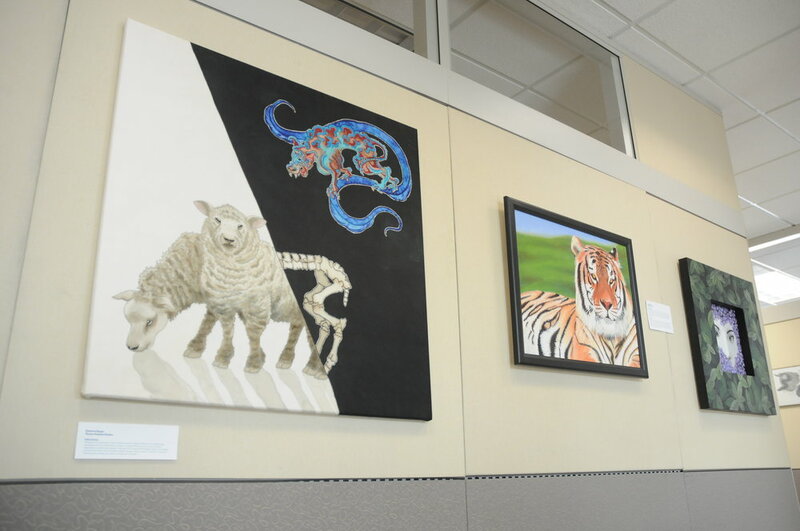 Art pieces lined the hallways on the second floor of the building outside the Center for Career Development. The pieces covered a wide array of mediums, featuring paintings, sketches, photography, graphics and much more. Pieces in the exhibition were presented alongside a brief description of the artist and a short excerpt explaining the piece to those in attendance. Much of the media presented showcased the thoughts and feelings of their respective artists. Several pieces depicted the artists’ struggle with anxiety, while others told a story about the artists’ lives. While many of the photographs presented acted as a snapshot of the photographers’ lives, a majority featured nature and travel. “I like that they have a lot of different kinds of art, and a lot of different ideas that they are trying to express all in one place,” Matthew Stojanov, a third-semester mechanical engineering major, said. The pieces at the exhibition were created by a wide variety of majors at UConn. Interestingly, many of the featured pieces were created by non-art majors, a fact that was noticed by Megan Willison, a graduate student of anthropology. “It’s cool to see the diversity of artistic talent in people that don’t necessarily follow an art focus,” Willison said. This is the fourth semester that the Student Art Exhibition has taken place. A panel of judges from the Center for Career Development and the School of Fine Arts decide which pieces will be featured in the next exhibition. Pieces for a new exhibition are chosen each semester, giving students plenty of time to have their art featured before they graduate. Bridget Smith, a fifth-semester digital media and design major, had her piece “Gaze” featured in the exhibition. This semester’s exhibition marks the third time Smith’s artwork has been featured, but she said it is still exciting to hear that her piece has been selected. The Student Art Exhibition will remain on display in Wilbur Cross until the end of the semester. Point/Counterpoint: Who should start for the Huskies at quarterback week 2 against USF?